Home » All Articles » What is Microclustered Water? while also accelerating metabolism and excretion of waste material. During the Ionization process, alkaline water undergoes a profound change. From ordinary H20 it becomes OH-. This means it becomes a powerful antioxidant formula at an atomic level. It also means that it changes the way its molecules group together. Instead of 'clumping' in large groups of 12-15 molecules, it gathers in much smaller groups about half the size. This is why people refer to the experience of drinking from water ionizers as effortless, or 'silken'. This change of molecular form also means, according to Dr. Hayashi, of the Japanese Water Institute, that it gains the ability to penetrate tissue and cell walls far more easily. This is why many people experience detoxification effects in the first few weeks of drinking the water, as it infiltrates areas that have not been reachable with ordinary H2O. This is what is called 'Microclustered' water or Restructured Water. Water is H2O, two hydrogen atoms for each oxygen atom. 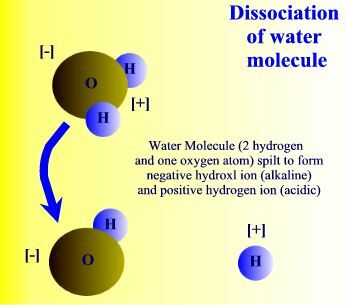 Neutral water has an equal number of OH- ions (hydroxyl ions) and H+ ions (hydrogen ions), maintaining the 2 to 1 ratio of hydrogen and oxygen atoms. Alkaline water is water with more OH- ions than H+ ions. This water has more oxygen atoms compared to the 2 to 1 ratio of hydrogen to oxygen atom of regular water. The resulting OH ions combine to create negatively charged alkaline water with extra oxygen that we drink. The resulting HH ions are positively charged and acidic that we use externally.